The DoorWay Program provides intensive and supportive treatment services and The Mayfield House provides transitional living aftercare treatment for up to several years to employed graduates of the DoorWay Program. The Mission’s Social Services Department caseworkers assist the students while in residence and post-graduation by reducing or totally resolving the issues that have been mounting over years of ignoring medical, dental, legal, past taxes, and child support. The DoorWay Program has 147 beds and the Mayfield House can accommodate 11 graduates. Upon intake the client undergoes the Addiction Severity Index (ASI) assessment. Meets with a Licensed Chemical Dependency Counselor (LCDC) to create an appropriate treatment plan. Meets with a Caseworker to create an appropriate social services plan. Attends daily AA or Celebrate Recovery session. Genesis Phase 1: These first 72 hours are spent in the observation dormitory for rest and acclimation to the environment. It also provides staff the opportunity to check vitals on a regular basis. The Mission does not have detox. White Badge Phase 2: Month one is in the Intensive Treatment Phase in the emergency homeless shelter. The day starts with devotion at 6 am followed by breakfast. The first class starts at 8 am and last class finishes at 8 pm. Lights out at 9:30 pm. Student is confined to the property in the White Badge Phase. Green Badge Phase 3: Months 2, 3 and 4 the student is in the Supportive Treatment Phase. Student has job assignments on campus half of the day and attends substance abuse treatment classes and academic classes in the Center for Education and Career Guidance the other half. A list of job assignments and classes are found below. The student stays on campus except for medical or court appointments and church. Yellow Badge Phase 4: During Months 5 through 7 the student is in job readiness, job preparation, job search, and ultimately employed by the time he is to graduate or shortly thereafter. These last two months are spent with men attending pre-employment classes at partner organizations’ locations. Each student is expected to have a job at the time of graduation or some form of supportive income. It is possible for the program to be extended beyond 7 months if the student is not employed. 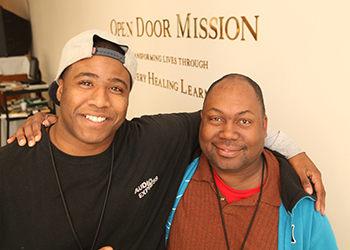 Men must be graduates of the Open Door Mission DoorWay Program. Men must have verifiable employment/income. Men must have church affiliation with regular attendance. Men must participate in designated DoorWay classes and activities acting as leaders, teachers, facilitators, and mentors. Eventually, they can become sponsors or men in the Doorway Program. Men must abide by Mayfield House rules including curfew. Men must pay the Mission weekly rent of $100. The rent includes 3 meals per day at the Mission, the opportunity to participate in all programming – 12-step meetings, support groups and church and are encouraged to save money for an apartment down payment or a vehicle. They also have access to the Social Services Department. Interested in this program or know someone who will benefit from it?